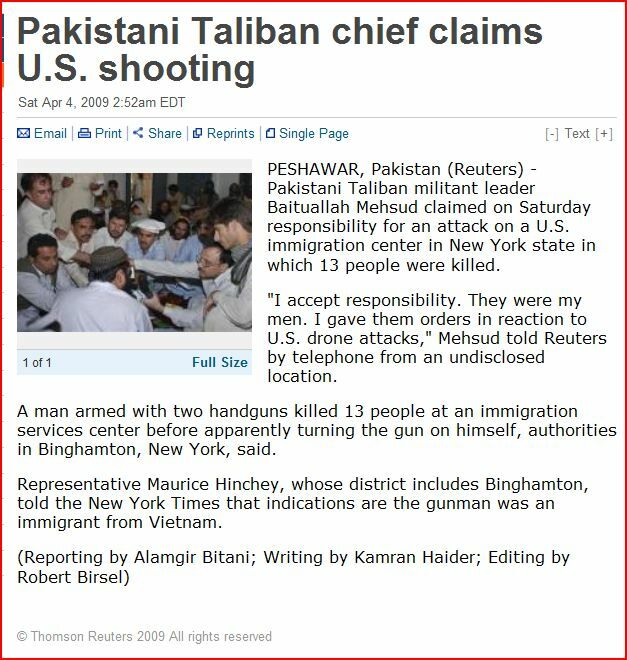 Warner Todd Huston at Redstate has pointed out a Reuter’s article (screen shot) in which a member of the Taliban claims responsibility for the shootings yesterday in Binghamtom, New York. Reports suggested that a certain Jiverly Voong (apparently a Vietnamese name) is the shooter responsibe for the attack. Huston suggests that the article was politically motivated to undermine US efforts to fight terrorist with unmanned drones. Whatever be the case, Reuters has reported a rumor that promotes terrorist propoganda without even attempting to verify the story. This is a serious breach of journalistic ethics (or are those two terms an oxymoron? ).